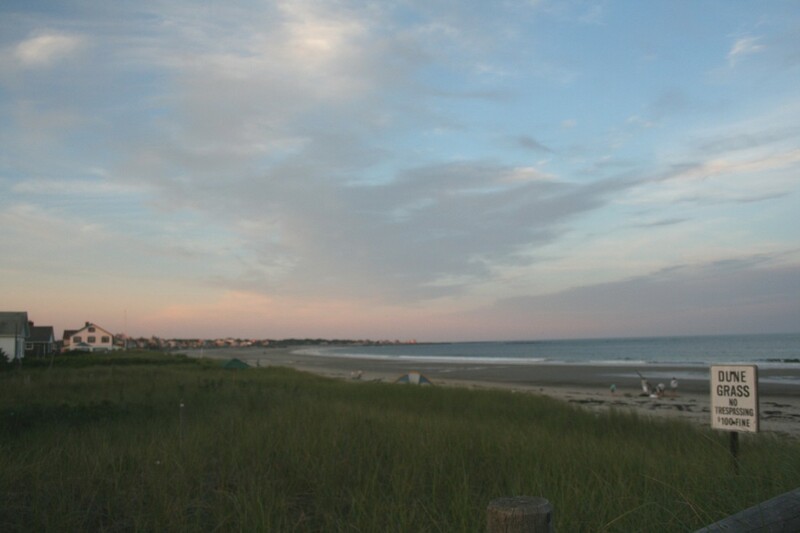 It is a beautiful Tuesday morning here on the coast of Maine. The sun is shining and wonderful things are popping up through the dirt. Several years ago I had pots of Pansies on my side steps. The past 2 years they have come back – I have not planted a Pansy in 2 years but there they are smiling up at me when I walk out the door to get the paper every morning. 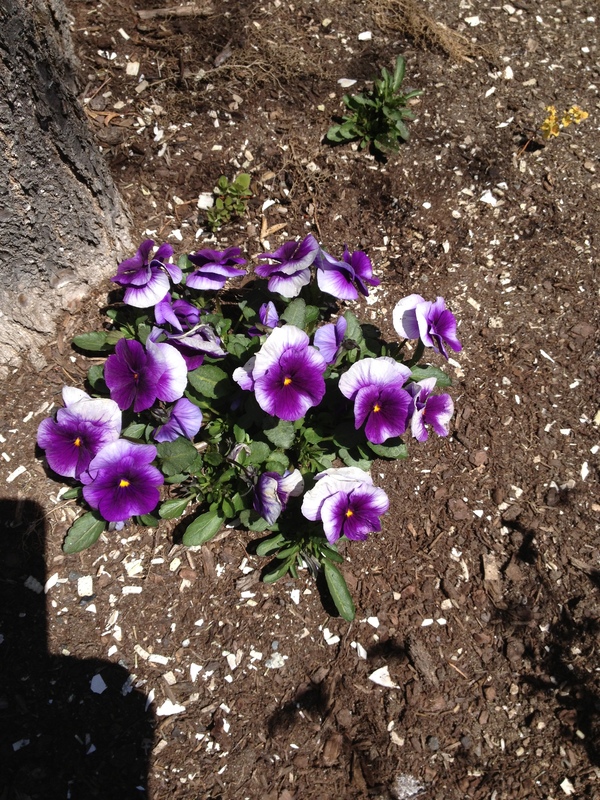 I love Pansies! I have been doing alot of sewing/quilting lately. This pattern is called Fruit Cake – it is made using a collection of fabrics called a Layer Cake – A layer cake is 10″ precut blocks. 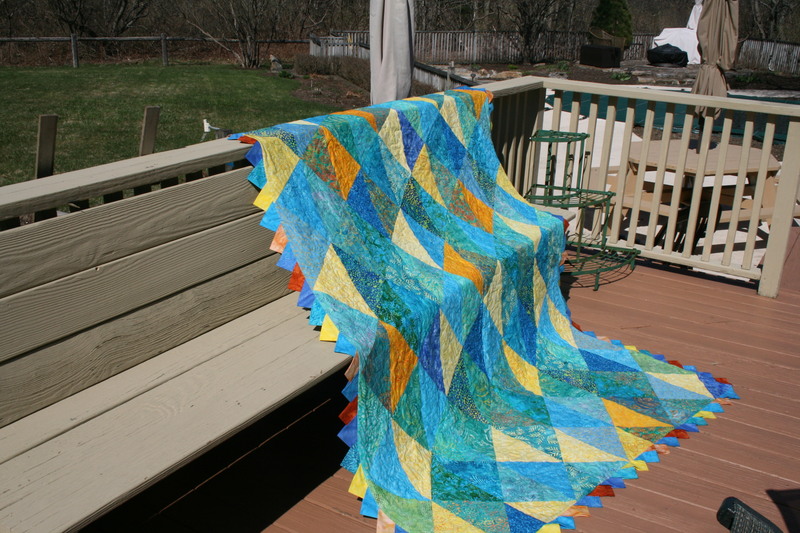 I love the batiks in this quilt – it reminds me of the sun shining on the waves in the summer. The edge is praire points – these are squares of fabric folded and added to the edge. I machine quilted this quilt with my new sewing machine. I used an entire spool of thread on this quilt. Thankfully I ran out just as I came to the last stitch. Happy, Happy! 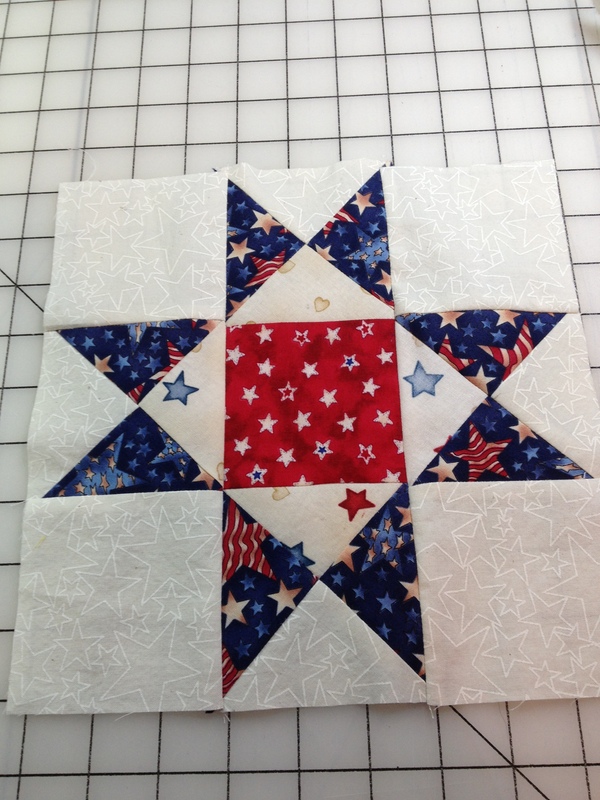 Another project that I am working on is Potholder quilts for our returning soldiers and veterans. My quilt chapter is of course helping me with this project. We will be making 12.5″ finished blocks that are quilted and bound. We then stitch them together to make a whole quilt. Ohio Star blocks 12.5″ quilted and bound. Just hand stitching left. We are hoping to have a pile of quilts done by Veterans Day 2013. I was inspired to start this project by a lecture given by Pam Weeks who is the curator of the New England Quilt Museum. Pam wrote the book Civil War Quilts and came and did a lecture about the quilts that were made by the woman of New England for the soldiers in the Civil War. It is a fascinating book and story of what women did to help the war effort. 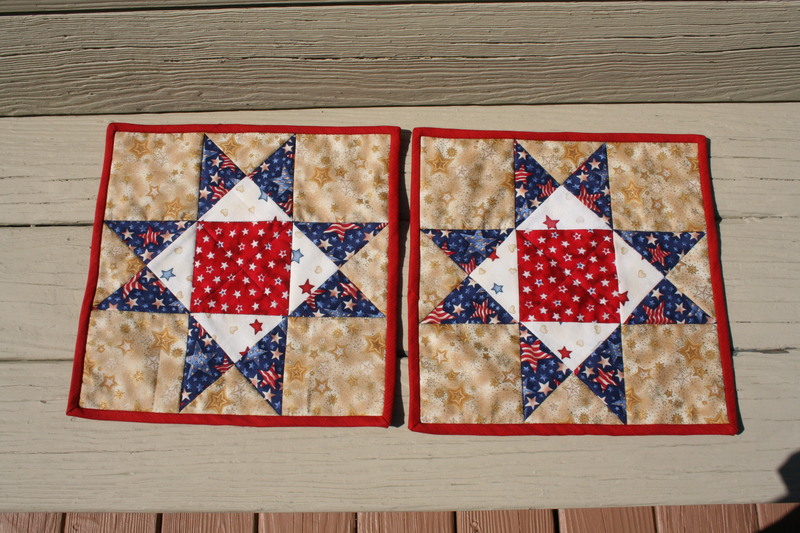 These are 2 of the blocks that I made for the Potholder quilts. 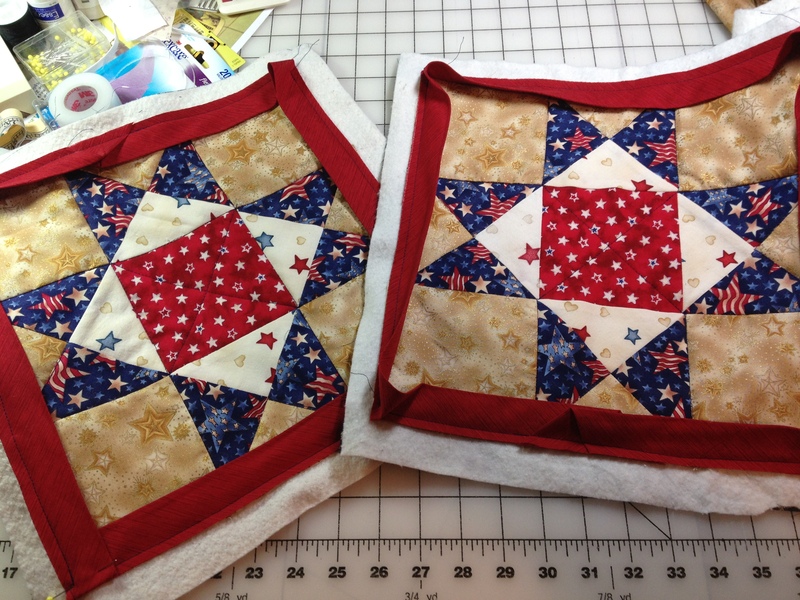 They didn’t take me too much time and I really enjoyed digging through my Red, White and Blue fabrics to make some Patriotic Blocks. My project for today is to get the binding on my Easy Street Quilt. 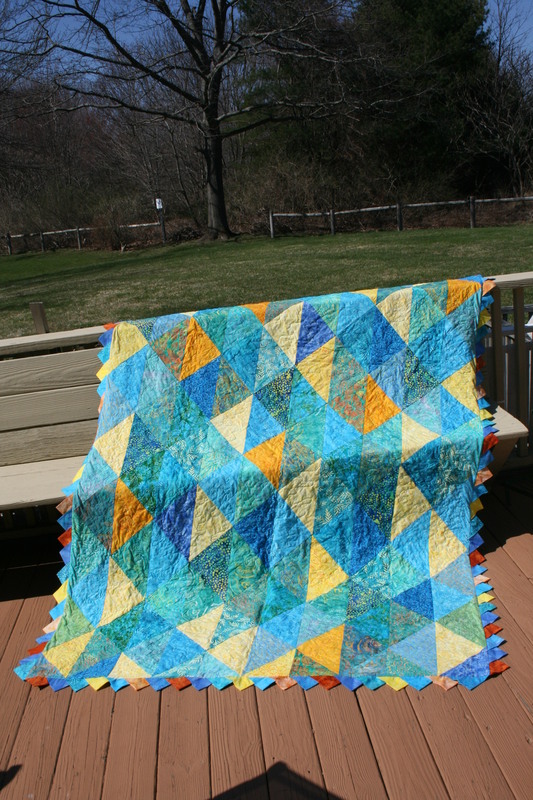 My friend Clara did the longarm quilting on this quilt for me. It is much to big for me to quilt on my sewing machine. Someday I may have the confidence to quilt a quilt this large but not yet. Hopefully I will have a picture for you within the next few days. All of the people who are participating in the Swap are posting on a Forum. When I sign my posts I write Faith in ME. Of course my name is Faith and I live in Maine. Hence the sign off. One of the other participates mentioned that she appreciated the signature because it caused her to pause and have “Faith in ME”. I was touched by this sentiment. We do need to have Faith in ourselves, we need to have confidence to take a risk. We need to have the courage to do things that may make us a bit uncomfortable – an example of this is me writing this blog. I still have doubts when I think of a topic that anyone will even be interested enough to read it. I have doubts when I pull piles of fabrics out of my stash to start a quilt. Do these fabrics really go, should I use one color or another? All of these self doubts bombard us on a daily basis – sometimes it involves our relationships, sometimes it involves our jobs or career choices. We have to learn to trust our guts!!! Don’t have “buyers remorse”. Right now I am working a quilt challenge – all of the participants had do bring in an 8″ square of fabric. 21 of us are involved. So we each need to make a quilt using all 21 different fabrics and it can’t be larger than 144″ outside dimension. 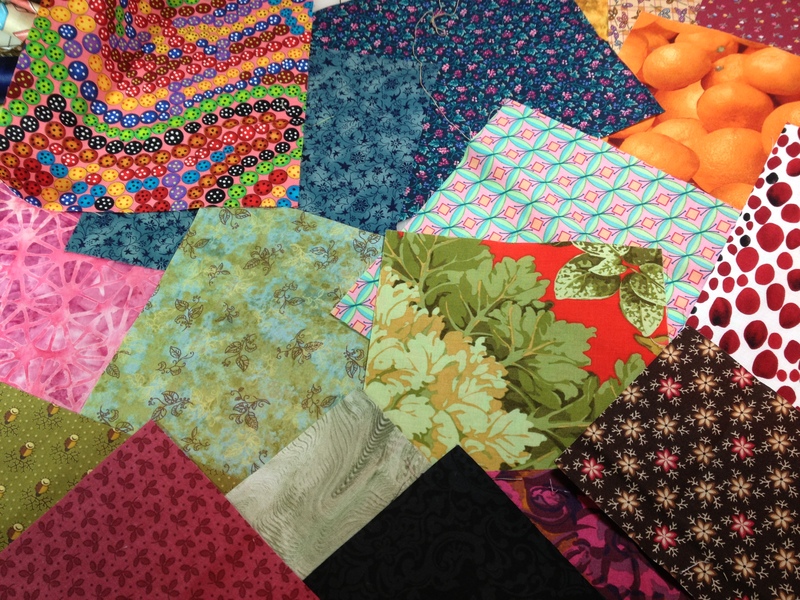 So I started to cut these fabrics and work out how I was going to use them all to make a quilt. I have to have “Faith in ME” that I would choose the correct design and use of these fabrics. I don’t have any extra – once it is used it is gone. I will keep you posted – I started to sew last night. So far so good. I have an idea I just have to be very careful not to make mistakes that prevent me from achieving my desired results. Learn from your experiences and have Faith in ME. It is chilly and breezy here today – hope some warmer weather is on the way.